Our 2019 run season kicked off with a super entry of 16 machines including five pukka vintage models. Oldest was Alan Bailey’s 1928 Ariel Model E; youngest was Dave Sketchley’s 1981 Laverda 350 twin, much rarer than the 500. The weather was dry but overcast and surprisingly cool, as witnessed by the rosy cheeks of several riders on their arrival at the start. This year, the route returned to North Warwickshire, leaving Kenilworth along Crackley Lane, via Burton Green to Berkswell and Meriden. The emphasis was on twisty B-roads rather than single track lanes and reached as far North as Baxterley before returning to Meriden via Hurley, Furnace End and Maxstoke. 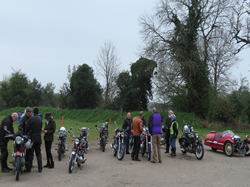 A short run along the A45 took riders to the finish at the National Motorcycle Museum. The leading group on more modern machines took just under an hour and a half to complete the 45 mile run but Alan Bailey turned up only 10 minutes later on his Ariel, showing that, regardless of machine, there is a natural rhythm for many of the roads we travel and that machines of different eras can be compatible. A big thank you to all the riders who turned out. Our thanks go to Marty Roberts for organising the event.